When I, an American, see a big ol’ Thanksgiving feast spread on the table, it makes me salivate. It’s a feast I spend weeks looking forward to. I think that’s probably true for most of my countrymen. But to my Chinese friends, Thanksgiving is…blah. We’ve learned through several attempts that the beloved American meal, which has a surprisingly standard menu, even accounting for regional or family variations, is a very anticlimatic, ho-hum affair for our Chinese friends. For one thing, the feast looks very…pale. The color spectrum looks like you took home the paint chip cards to decide on colors for a hotel lobby. You get to choose between Turkey Tan, Stuffing Beige, Mashed Potato Off-White, Dinner Roll Golden Tan, or Gravy Greige. There are a few dishes that stray from the constraints of off-white, but they’re subdued due to long cook times, like the green beans and sweet potatoes. And even those are usually topped with something (mushroom gravy & fried onions; broiled marshmallows) to stay with the tan theme. For another thing, all the flavors are really…bland. When a small dollop of cranberry sauce is the only bright, exciting flavor of the entire meal, it’s definitely the level of “recovering from a stomach bug or major surgery” level of bland. And, perhaps most off-putting to our Chinese friends, it all tastes really….sweet. I know, I know, gravy isn’t sweet. But turkey is a sweet-ish meat, especially with cranberry sauce on it. Sweet potatoes are sweet, and then they get sweeter with the addition of marshmallows. Rolls are considered sweet in China, and the list goes on. In my family, there’s Jell-O at every Thanksgiving. Sweet. I know another family that always has cinnamon rolls (yes, during dinner). Very sweet. And if all that isn’t enough, we have a giant dessert spread after the meal. Not just one piece of pie, folks, but a small piece of everything that everyone brought, which generally means pumpkin pie, apple pie, pecan pie, and on and on. Gag-level sweet for Chinese friends. 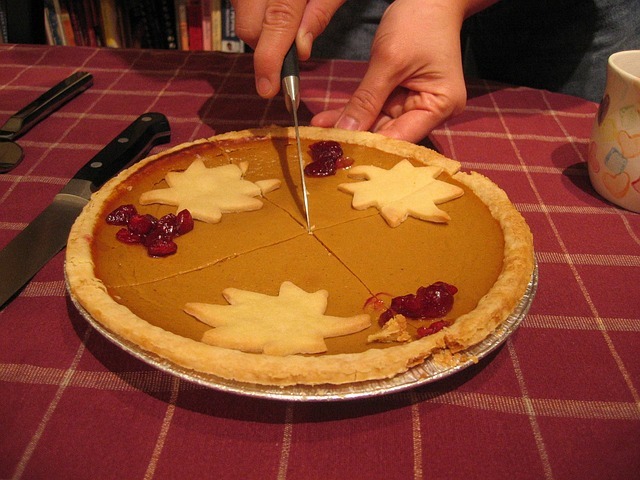 All in all, we’ve learned that Thanksgiving is not the right meal to showcase American cuisine. It’s not worth the major effort of cooking all that fabulous stuff just to underwhelm them. Our Chinese friends have been way more impressed when we make pizza or tacos. We’ll stick with inviting them over for meals like that when we want to treat them to something special. But that’s okay. More turkey and stuffing for us! You might also try making a stir fry dish along with rice. I’m from Hawaii so some people here also have rice. If we have Asian friends with us, we make sure to also have rice and other more suitable dishes. They can sample some of the things that are less appealing to them and then fill up on dishes they like. I guess I can tell them it IS traditional to have rice at Thanksgiving in at least one of the states! Ah fir the apples and celery and walnuts and sage and cornbread stuffing, zippy orange and not so much sugar in the cranberries, but what I long for most is ALL if the family gathered around the table. My dad hated turkey, so one year we went out for Chinese on Thanksgiving and another we grilled steaks in the mountains south of town. I’d be happy with PBJ if it meant the whole family together! I’m missing you and the ones passed and the one list today! Fun observation. Hey, I’m making tofu turkey this Thanksgiving for our Indian (subcontinent) friends. Talk about blah. No cumin, no garam masala, no chillies, no asafoetida, no peppercorns. How could that be good? I’ll give you a full report. Happy Thanksgiving to your fabulous family! Wow, I definitely want to know how the tofu turkey turns out! It was so good that people came back for seconds and some vegetarians had to do without. Very flavorful, to my surprise. Even tasted a bit like real turkey, especially with a healthy dollop of vegetarian gravy. I’ll do it again, since it was pretty simple and used ingredients I usually have on hand. What a surprise! Very good to know, and thanks for the recipe link. I’m glad it turned out so well. It was nice of you to go to that effort for your vegetarian guests, even if not all of them got to enjoy it.